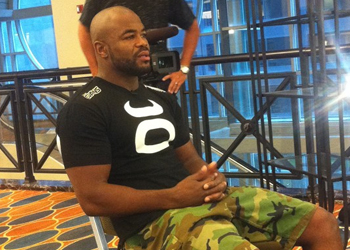 Early reports on Wednesday suggested Rashad Evans (Pictured) would finally get the opportunity to settle his beef with friend-turned-foe Jon Jones at UFC 140. However, UFC president Dana White quickly killed that chatter after it was discovered Evans’ surgically-repaired right hand wouldn’t allow him to answer the bell. Jones is now slated to defend his light heavyweight crown against Lyoto Machida on December 10th. While Evans has been next in line for quite some time, he completely understands that the Octagon show will wait for no man. “After my last fight against Tito Ortiz, I dislocated my right thumb, which required it to be set back in place and held with pins,” Evans expressed in a statement released by Authentic Sports Management. “Twenty four hours ago, my physician removed the pins. At that time, I learned that it would require another three weeks of rehabilitation before engaging in any exercise or training that would require the use of my hand. Evans bumped his record to 16-1-1 after posting a lopsided TKO win over Ortiz at UFC 133. However, he originally secured his top contender moniker after taking a unanimous decision victory over Quinton “Rampage” Jackson at UFC 114 in May of 2010. His highly-anticipated shootout with Jones has now been postponed twice. Ironically, a hand injury suffered by Jones nixed their initial encounter. “I’m asking for the fans to support me as I rehabilitate my hand, and I promise I will be back fighting very quickly,” Evans said in closing. Evans is expected to fight the Jones/Machida winner in early 2012.